The Benque Market is coming soon! They had the ribbon cutting ceremony yesterday with the mayor and other stakeholders. Benque was chosen earlier this year to be Belize's next tourism destination, and for good reason. It's wonderful seeing Benque, known for having a special culture all its own, get these much deserved projects. They'll have permanent and temporary stalls for rent. Call 803-2020 for more information. The ribbon-cutting ceremony for the Benque Market was held yesterday at Corner of Wyatt & Kennedy Street! 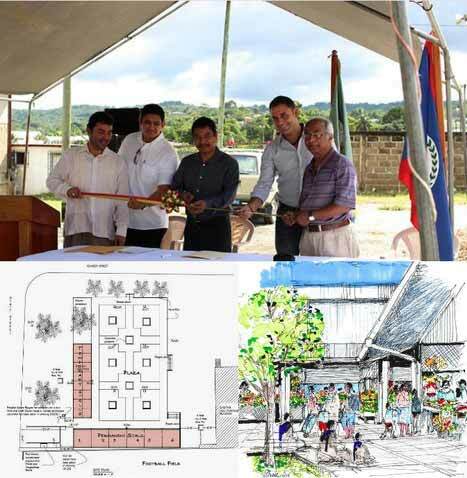 The Mayor of Benque Viejo del Carmen, Miguel Velasquez cut the ribbon after introducing the market plan. Some of people helping the Mayor to cut the ribbon were L-R His Excellency Mr. Said Badi Guerra, Ambassador of Belize, Mr. Ricardo Gongora, representing National Authorizing Office, Mayor Velasquez, Mr. David Sanfiel, Civil Engineer representing European Union and Mr. Subrata Basu, Peace Corps volunteer. Are you looking forward to the new market ?